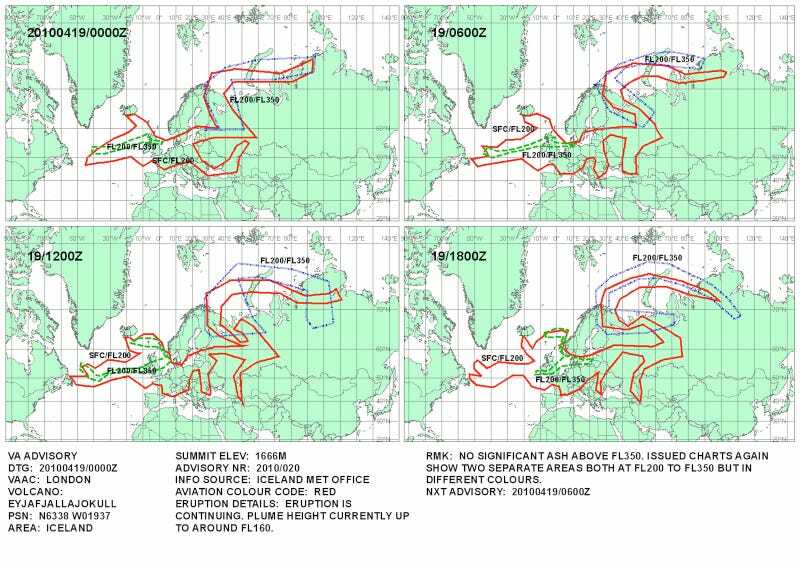 These latest UK Met Office predictions show the Icelandic volcano Eyjafjallajökull's air travel havoc-wreaking ash cloud moving its smoky tendrils closer to North America and the United States. It's comin' right for us! We have no idea whether or not wind conditions make the ash cloud hitting the United States even possible — let alone whether or not it'd be disruptive. But, judging by the E.U. reaction, we may be in for some kind of flight disruptions beyond outbound-to-Europe flight stoppages if it does hit. We'll be watching and waiting for Eyjafjallajökull's next move.